A reconnaissance satellite successfully launched Saturday on a Soyuz rocket, joining a twin Earth observation craft already in orbit to collect nearly 1,000 high-resolution images a day for the French armed forces and commercial customers around the world. The craft lifted off from French Guiana on a Soyuz rocket at 0202:50 GMT Sunday (9:02:50 p.m. EST Saturday), and the launcher's Fregat upper stage placed the satellite in an accurate orbit about 430 miles above Earth. The Fregat stage deployed its payload about 55 minutes after launch. The mission marked the fourth Soyuz launch from the Guiana Space Center, a European-run spaceport on the northeast coast of South America. The European Space Agency and the French government financed the construction of the new Soyuz launch facility, which European officials plan to exploit for commercial and institutional payloads. "This success of Soyuz confirms the reliability of the Ariane launcher family," said Jean-Yves Le Gall, chairman and CEO of Arianespace, the commercial operator of the Soyuz rocket. The mission's 2,138-pound satellite, named Pleiades 1B, rivals the imaging power of privately-owned spacecraft operated by GeoEye and DigitalGlobe, two firms providing commercial reconnaissance imagery to the U.S. government. Led by CNES, the French space agency, the Pleiades satellites will collect high-resolution optical imagery for military and civilian users. With additional ground processing, the satellites' cameras have a resolution of 50 centimeters, or less than 20 inches. Up to 50 images per day from the Pleiades system will be dedicated to French defense and intelligence services, and the rest will be available to commercial users, according to French Gen. Laurent Collet-Billon, director of the military's DGA procurement agency. French defense minister Jean-Yves Le Drian, who was in French Guiana and viewed the launch, said the launch of Pleiades 1B was "a day to remember" and would aid military operations. Together with Pleiades 1A, which launched in December 2011, the new satellite will enable global coverage every 24 hours. "Every country in the world is accessible by Pleiades in one day," said Jean Dauphin, director of Earth observation at Astrium, the satellite's prime contractor. 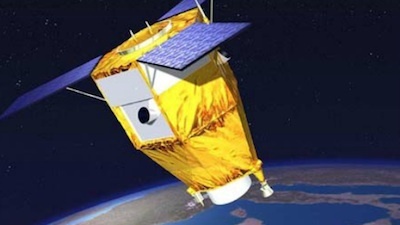 CNES officials expect the two-satellite system to be fully operational in the spring of 2013. "Pleiades imagery is proving really popular, particularly with military, institutional and commercial users," said Alain Gleyzes, Pleiades project manager at CNES. "Pleiades 1B will double the system's capacity and provide daily revisit capability anywhere on the globe." Control moment gyroscopes allow the Pleiades satellites to quickly pivot from one target to another, meaning the spacecraft can image multiple targets in one pass. The agility also permits the Pleiades satellites to acquire imagery for a wide-area mosaic in just a few minutes, and it can enable three-dimensional and tri-stereo image products. The Pleiades system is partially funded by Belgium, Sweden, Spain and Austria. It will complement France's Helios government spy satellites and the Spot series of commercial imaging craft. "Fresh and frequent information is what matters most for military operations," said Brig. Gen. Yves Arnaud, head of the French Joint Space Command. "That means getting the right imagery at the right time." Under separate arrangements, Spain and Italy's defense ministries will receive optical images from the Pleiades system. France and Italy have an agreement to share Pleiades imagery and radar data from Italy's COSMO-SkyMed satellite system. Astrium Geo-Information Services has rights to sell Pleiades imagery commercially. "Pleiades is featuring the best reactivity possible in the industry, meaning the time from the programming request to delivery to the user is reduced to a minimum, thanks to a very smart design both of the space segment and of the ground segment," said Charlotte Gabriel-Robez, Pleiades marketing manager at Astrium Geo-Information Services. 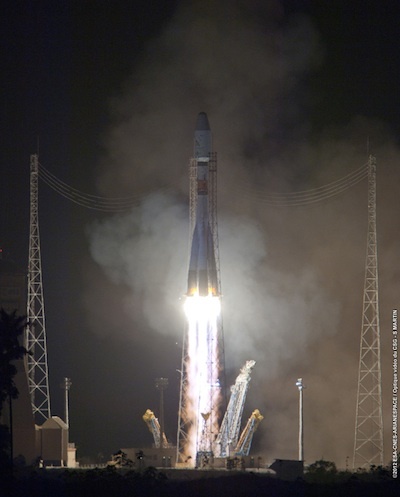 Pleiades 1B was built by Astrium Satellites in Toulouse, France. Thales Alenia Space provided the satellite's optics and other hardware. "Together with the French space agency CNES and Astrium, we are delighted to contribute to the Pleiades 1B satellite launch by providing our expertise in high-resolution optical instruments," said Jean-Loic Galle, president and CEO of Thales Alenia Space. "Given our European leadership in high performance optical systems, and our position as a world-class supplier of space radars and altimeters, Thales Alenia Space continues to be a pivotal partner in all new Earth observation programs." Designed for a five-year mission, the Pleiades satellites each carry a Korsch telescope built by Thales Alenia Space with a primary mirror 2.1 feet in diameter. Its CCD detectors are 40 times more sensitive to light than those in standard consumer digital cameras, according to CNES.